Stromkern returns with a hard hitting whirlwind of electronic mutilations, intoxicating beats and an occasional driving guitar. 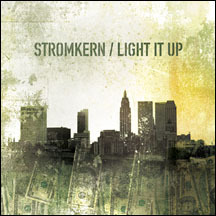 Stromkern's latest release, Light it Up, picks up where its predecessor left off and showcases a more advanced Stromkern. Stellar tracks like Standup, Reminders, Sentinel and Forgiven lead the new assault and assure Stromkern's role as one of the new pioneers of the American electro scene. Light it Up also features guest appearances from Frank Spinath of Seabound and Victoria Lloyd of HMB, Monochrome and Claire Voyant.